The science of innovation is the science of human systems, which are biological. Innovation cultures require the language of living systems. Rainforest ecosystem behavior is analogous to human innovation ecosystems. To give you a quick overview of the science of innovation and why we call innovation ecosystems “Rainforests”, we're going to unpack a bit of it here. Spoiler alert: This overview is a small part of what gets covered in our Rainforest Immersion 1-day event. Our thinking about innovation is based on long study of how Silicon Valley came to be what it is. We asked ourselves a really simple question: What is it about Silicon Valley that led it to be one of the most innovative cultures in the world? The question is simple, but the answer is not, and by necessity the answer draws on many different disciplines. That work is captured in the book The Rainforest: The Secrets to Building the Next Silicon Valley by Victor Hwang and Greg Horowitt. But you can start thinking about the answer in a simple, dualistic framework, as one of competing ways of thinking and acting on the world. And, when you sum it all up, you can think about Silicon Valley – and innovation – as a product of a culture that accommodates both of these opposites. Think about Silicon Valley, and innovation, as these two opposites in creative tension but always trying to combine. And think of the first as . . .
Control. 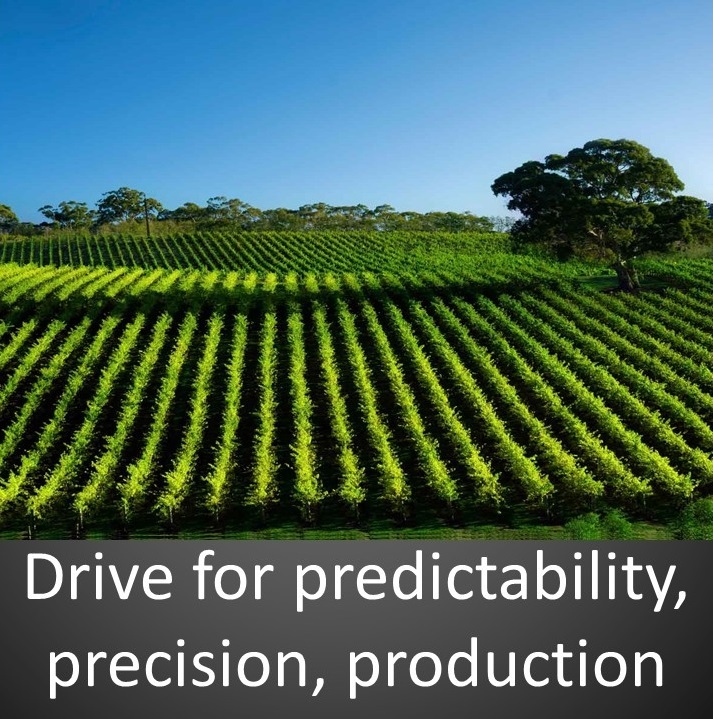 When you see those three words: Predictability, precision, and production. And when you look at this wonderful picture of nice green plants, in nice green rows, under a blue sky . . .Well, it’s kind of hard to think about this as anything other than wonderful. And as leaders accountable for the profitable workings of a large-scale enterprise, these words have a certain allure. What could possibly be wrong with these words, or with this picture? Or, asked differently, what might be missing here? One way to think about this picture of a highly controlled output process is to speculate about the mindset that leads to it, which is. . . Mistakes. But if you are solely about control, how will you create a culture of innovation? If mistakes are punished, what about innovation? What kind of culture is reinforced when experimentation, and failure is reprimanded? As Peter Drucker once said, "Culture eats strategy for breakfast." You may have a brilliant strategy. You may have all the right tools and data. You might even have all the right talent. But, if your culture is purely focused on cost, command, and control, on predictability, precision and production, innovation capacity will be very hard to generate. What innovation there is will be slow and painful. Most likely, when there is a spark of innovation, it will be an unsustainable flash in the pan. Which brings us back to where we started: What Makes Silicon Valley Tick? We’ve been talking about the opposite of Silicon Valley – the world of command and control, of predictability and production. But if we know the opposite of Silicon Valley, we have to ask the question: Can we actually define what makes Silicon Valley tick? And – much more important – even if we can define it . . .Can we replicate that spirit anywhere? A way to understand Silicon Valley – and cultures of innovation – is to start with this idea, from James Kenneth Galbraith: “The principles that underlie biological systems are the same principles that underlie all living systems." Galbraith helps us see the distinction between the mechanical, predictable world of command and control, and the more organic world of innovation. Systems – companies, organizations, countries, regions – are not static, defined entities, no matter how may we try to make them so. They are breathing organisms, subject to the same kinds of variance and unpredictability and randomness as are all living organisms. So, we begin to think of places like Silicon Valley, and innovative cultures around the world, not so much as things to render more mechanical and predictable, but as . . .
Rainforests. This is much more than a metaphor . . . It’s a way of thinking about innovative cultures, a way to see the benefit of randomness, serendipity, and the unforeseen. It shows us that for any organization to thrive as an innovator, there must always be Rainforest present. It is where the new is born, where untold random interactions produce surprises and wonderful things. This is where the future comes from, a future that we cannot produce in "farm" settings. As we've tried to reverse engineer the Rainforest into organizational planning and thinking, we always come back to the conundrum of control. How can you cultivate a Rainforest inside a farm, without killing one or the other? 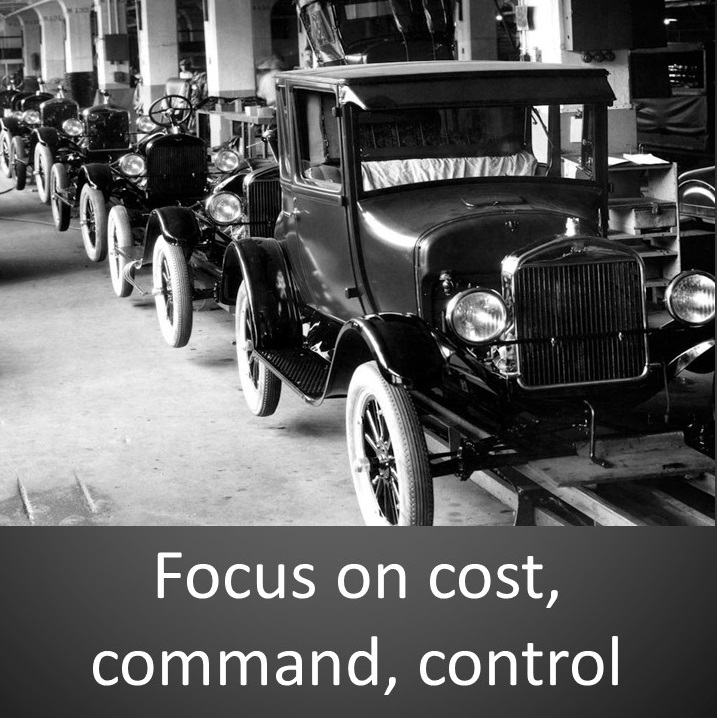 How can you grow your innovative capacity with losing control of your business? The short answer, we would argue, is no . . .And that is because while there is no “control” operating in the Rainforest, or in the highly innovative and disruptive culture, however, there are powerful principles at work. And if we can get a handle on these principles, and better understand how a Rainforest might operate itself to be more innovative, then we can take those principles and embed them into any organization, at any scale and the result will be a culture that tends more and more toward innovation. 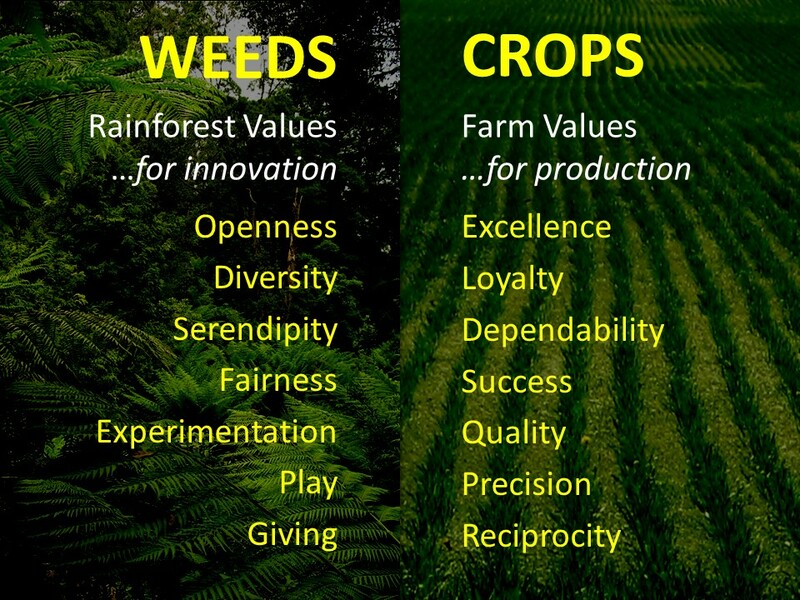 Here's a bit of an over-simplification, but a handy way to begin thinking about the issue. . .Weeds vs crops. The Rainforest on the left thrives because of uncontrolled processes; the farm-like rows on the right produce a maximum yield based on precise control. As a rule, we tend to think about “good” businesses and “good, well-run organizations” from the perspective of the farm, not the untidy Rainforest. But, each mode – weeds and crops – has its own recognizable set of principles and values . . .
We frame these complementary sets of operating principles as: Rules of the Rainforest – the innovative aspects of culture where everything is a weed; and Rules of Farms where command and control is king, and weeds are discouraged. When an organization is in innovation mode, when its leadership is innovation focused, whether by design or by chance, it is very likely that the Rules of the Rainforest will be dominant. When it’s more in command and control mode, the Rules of the Farm will be more dominant. This is not to suggest that one set of rules is better than another; if you look at the Rules of the Farm, in isolation, it will sound pretty inspiring. But when you think about the Rules of the Rainforest, you can start to feel how one set without the other is incomplete. You can see a similar contrast when you compare the values of a Rainforest wtih those of a Farm culture. Values matter. Farm Values yield enormous benefits to civilization, they are what keep society chugging along: rule of law, reliable utilities infrastructure, telecommunications infrastructure, only continue because of these values . We wouldn't last long without them in place, and a great deal of innovation wouldn't be possible without these values running in the background. And yet, these values don't help much when societies and economies need renewal. They don't help us much to cope with significant change imposed from outside, or to deliberately invent and forge new futures. It takes both - a yin and yang balance - creative tension. In the most innovative places they work in harmony as part of an explicit innovation strategy. Helping you cultivate that harmonious balance in your culture, leadership, and strategy is what we do. Download a complimentary copy of our Rainforest Scorecard innovation assessment to start thinking and communicating with your peers about what goes into a Rainforest innovation culture. Fill out the Rainforest Scorecard (short-form) assessment online. Most people complete it in under 20 minutes. We’ll provide you with an analysis of your scores - our thanks for checking us out. Schedule a Rainforest Immersion to get started with your group.